Here's a thing, in the world that I live in (and I think this is the same for 95% of the worlds population) if I see a sign that reads 'Warning! Bridge out ahead', probably accompanied by a pictorial representation of a little black car driving off the end of a solid black bridge painted inside a red bordered triangular sign standing erect on the roadside, I would consider my route very carefully. It seems reasonable to me to believe that to continue driving on said road will result in trauma, or possibly death. Should I be surprised if, ignoring the warning signs, I end up sat behind the steering wheel of my little car as it sails through the air into a ravine, deep gully or onto the freeway underneath? And who's fault is it? "An Adults ONLY story that contains some graphic and shocking violence coupled with intrigue and conspiracy, it is a portrayal of life and death in war-torn Russia, the depths of depravity a human can sink to, and the cruel mind games played by those in power. It is also a look inside the Kremlin and the NKVD in the time of Stalin, and into life in a USSR the early "Russian revolutionaries" would never have imagined." Described by the Wishing Shelf Awards as "A dark, horror-filled look at Russia in 1941. Powerfully written and fascinating." "A HIGHLY ENGROSSING, THOUGH VERY DISTURBING TALE"
"A Novel of Brutality and Cruelty"
All of this and yet still the Sunday School teacher type choose to read it and are shocked to the point of being "so disgusted I couldn't read another word...". I'm not surprised! Why the bloody hell would you choose to read a story that is clearly beyond the moral tolerance of someone that believes the sky is blue and the clouds are made out of candy floss?! People that live in a bubble where the sun always shines, flowers bloom and the dark side of humanity is denied an existence. 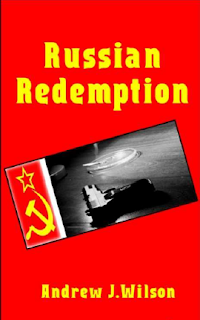 I don't want you people reading "Russian Redemption" - I don't want to be responsible for introducing you to the reality of war; the violence and the violations of the horrible side of sub human existence. And I sure as heck don't want you bleating about how shocked and mentally scarred the story has left you - It's supposed to!!! What's prompted this reaction? I got an email this morning in response to a review request submitted to a 'Review website' on 22nd August 2013 - just one line, 'Sorry.... 2 people tried to read it but couldn't so there is no review for you..' type email. It took nearly 2 years for that! A powerful and effective response. BRAVO!